I know you are flashing back to the 70’s, but that bed got me through several months of bed-rest when I was carrying my last two children. At one point, the nurse asked me how I managed to avoid bed sores and I shared that a waterbed does not give you any pressure points. There is one downside to a waterbed and that is finding waterbed sheets that will stay on. I shared my frustrations in a posts, see http://wp.me/pKNzn-qu. Waterbed sheets consist of a top sheet that is sewn to the base of a bottom sheet. It is only sewn together in the center third of the sheet for those who like to stick their feet out from under the sheet. Unfortunately, over time, the top sheet can tear away from the bottom sheet and then it will unravel. 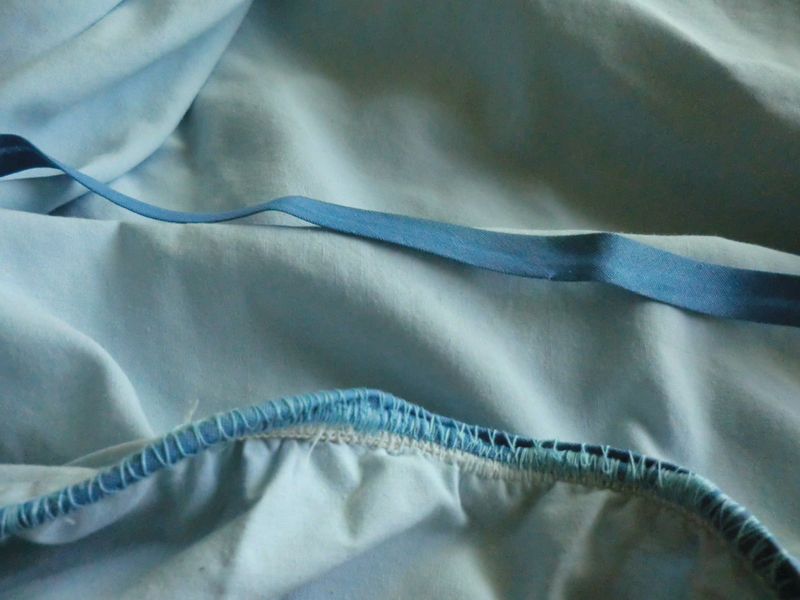 I have used the zigzag stitch to sew the sheets back together a few times. This time I added seam binding to the seam and used the zigzag stitch over all of the seam binding. I added seam binding to the base of my waterbed sheets. This entry was posted in Maintain It, Repair and tagged Maintain It, Repair It, waterbed sheets by Frugal Fish. Bookmark the permalink.